Флорентийский художник в "Удачливом Риме"
Здесь представлена вступительная статья (эссе) к седьмой главе каталога, сопровождавшего выставку работ художника эпохи Возрождения Фра Анжелико (15 век) в Музее искусств Метрополитен в Нью-Йорке в 2005 году. Автор статьи - Карл Брандон Штрельке (Carl Brandon Strehlke) - американский историк искусств, ассистент куратора в Музее Искусств Филадельфии, приглашенный профессор истории искусств Университета Джона Хопкинса, автор нескольких книг. Фра Анжелико: Флорентийский художник в "Удачливом Риме"
In his biography of Pope Nicholas V, written shortly after the pontiff's death on March 24, 1455, the humanist Giannozzo Manetti related the pope's deathbed defense of his ambitious building projects. (*1) His aspirations for Rome had been great— a commemorative medal of the Jubilee of 1450(*2) bore the inscription Roma felix ("the happy city, Rome")(*3) in honor of the city's renewal under his guidance. According to Manetti, Nicholas assailed the critics of his schemes as insignificant men unable to appreciate their greatness, and expressed regret at not finishing the Vatican palace, which he had intended to transform into a magnificent residence. The pope visibly shocked the cardinals gathered at his bedside, yet, unrepentant, enjoined them to continue his building campaign. 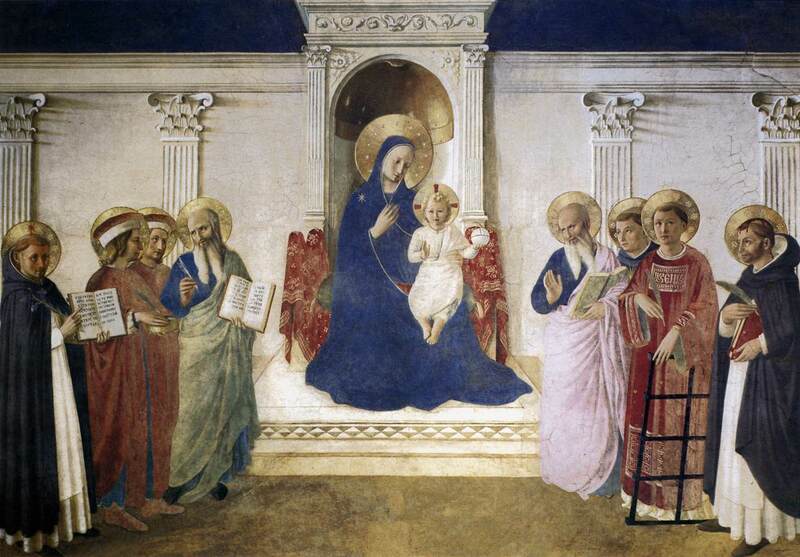 In the final review of his accomplishments, Nicholas recorded donations of precious objects to churches, codices that he had translated, and the learned men in his employ, but he was silent on the subject of painting, despite his commissions to the Tuscan artist Fra Giovanni da Fiesole (Fra Angelico) for a chapel and a studio in theVatican palace. In fact, the chapel and studio were located just a few yards from where the pope lay dying. Neither did Manetti mention Angelico, who had died a month before the pope. Manetti spoke only of the pope's close personal relationship with Bernardo Rossellino, the Florentine architect who oversaw the building projects and renovations. Except for Angelico's frescoes in the chapel, little of Nicholas's Roma felix survives today. Nicholas had inherited Fm Angelico from his predecessor, Eugenius IV, for whom the artist had begun the frescoes in the Chapel of the Sacrament, also in the Vatican palace. The date of this chapel, which no longer exists, can be ascertained from two documented events: in May 1446 officials of Orvieto Cathedral, then seeking a painter to fresco the Chapel of San Brizio, were informed that Angelico might soon be available. Secondly, a diarist, recounting that Eugenius's body was laid out in theVatican chapel after his death on February 23, i447, made mention of the fact that the chapel was newly painted. (*4) Work may have continued into the next papacy as Angelico's sixteenth-century biographer Giorgio Vasari noted that the frescoes contained portraits of contemporary individuals, and that the collector Paolo Giovio (1483-1532) had copies made of the likenesses of Nicholas V; the German Frederick III, crowned Holy Roman Emperor in 1452; and even Ferrante of Naples, who would succeed his father, AlfonsoV ofAragon, in 1458 (Ferrante's rights to the Neapolitan throne had been rec-ognized by Eugenius IV in July 1444 and had also been confirmed by Nicholas V). Copies of some of these portraits still exist, indicating that Vasari's information is correct. (*5) The main work would thus have been completed before 1447, and some portraits updated or added later. (*6) When the chapel was destroyed during the reign of Pope Paul III (1534-49) to make a proper antechamber for the Sistine Chapel, collectors were able to obtain fragments of the frescoes. Michelangelo, an admirer of Angelico, treasured one of a Madonna (now lost),(*7) and a detached fresco of a head of the young Christ, in the Museo Nazionale di Palazzo Venezia in Rome, may be such a souvenir. (*8) The Christ appears to have been executed by Angelico's assistant Benozzo Gozzoli, who is not documented in Rome until May 1447 — yet another indication that work on the chapel continued after Eugenius's death. The subject of the chapel's frescoes was the life of Christ. 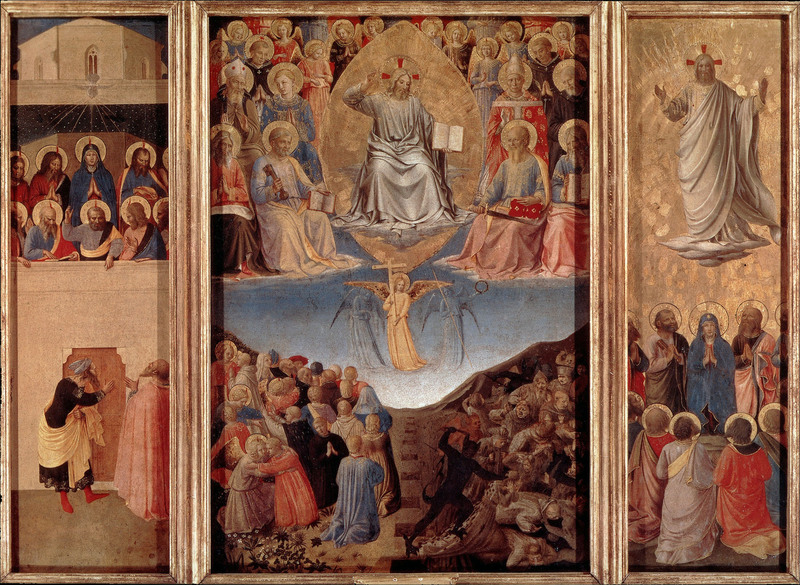 An early Florentine source (the Anonimo magliabechiano) described the chapel as truly a "paradise"(*9) — a reference to its beauty but perhaps also to the principal scene: the Last Judgment with a vision of Christ the Judge surrounded by the heavenly host. As is known from various derivations, the most distinct feature of Angelico's lost Last Judgment in the Chapel of the Sacrament at the Vatican was the depiction of Christ with his left arm raised in condemnation of the damned. Michelangelo famously adopted the gesture in the Sistine Chapel Last Judgment. Angelico repeated this same depiction of Christ in Orvieto Cathedral, probably because the patrons there desired something similar to the new Vatican frescoes. In the 1460s, Filippo de' Medici, Archbishop of Pisa, had a portrait medal made by Bertoldo on the reverse of which is an image of Christ gesturing as in Angelico's paintings (fig. 122). Рис. 123. Франческо Росселли. Гравюра с панели Фра Анжелико Страшный Суд из Санта Мария делла Анжели. It is one of the first examples of a reproductive engraving of a work of art, but it was to Angelico's Vatican fresco that the Florentines Bertoldo and Michelangelo looked as a model. The Berlin painting, which was originally a single panel, merits particular attention. John Pope-Hennessy attributed it to Angelico's collaborator Zanobi Strozzi,(*15) whereas, as Laurence Kanter has pointed out to me, it is, indeed, an autograph work by Angelico from the 1430s. The adaptation of its iconography for the papal project in Rome would indicate that the original owner was a member of the Curia, if not Pope Eugenius IV himself, who — after he had been forced out of Rome in May 1434 — settled in the Dominican convent of Santa Maria Novella in Florence, where he lived until September 1443, when he returned to theVatican. The Berlin painting has a Roman provenance, but it can be traced only to 1811. (*16) However, Bartholomaeus Spranger copied the panel (Galleria Sabauda,Turin) for Pope Pius V (r. 1566-72), suggesting that the original might, in fact, have once been in the Vatican collections. Angelico would have painted the picture for Eugenius or a member of his Curia during the pope's Florentine sojourn. It would have been taken back to Rome by the pope, serving as a model for the principal scene in the Chapel of the Sacrament. In the other triptych (fig. 94),(*17) now in the Palazzo Corsini in Rome, Miklos Boskovits identified one of the saints surrounding Christ as a portrait of Eugenius IV,(*18) making a connection with Eugenius's chapel even more compelling. It is also possible that the Pentecost and the Ascension depicted on the wings of that triptych are reductions of the frescoes as well. The only other record is a drawing in the Louvre of Christ Calling the Apostles. (*19) However, it is also probable that some of the scenes are reflected in a group of small drawings (cat. 47), now divided between the Museum Boijmans Van Beuningen, Rotterdam, and the Fogg Art Museum, Cambridge, Massachusetts, of scenes from the life of Christ. Their compositions are usually related to the silver chest commissioned by Piero de' Medici for Santissima Annunziata in Florence and executed in 1455-53. Yet, while there are many similarities, the compositions are not the same, indicating that they were based on another model. If the drawings do record Angelico's frescoes in the Chapel of the Sacrament, they might have been prepared for an important object, such as a reliquary, as Pia Palladino suggests in the present catalogue (see cat. 47). Alternatively, they could have been excised from a volume perhaps made for a distin-guished personage as a papal gift; the German emperor Frederick III, who was crowned by Nicholas V in Saint Peter's on March 19, 1452, is one possibility. (*25) A miniature portrait of him against a deep blue background was made about this time,(*26) and there is evidence of his curiosity about Italian art. (*27) The interest of Northern European patrons in the art of papal Rome is borne out by the copies of Masolino's frescoes of uomini famosi (famous men) in the Palazzo Orsini at Montegiordano prepared by Barthelemy d'Eick for King Rene d'Anjou and by Leonardo da Benozzo for an unidentified Lombard or Neapolitan patron. (*28) The Rotterdam and Cambridge drawings may have served a similar purpose. 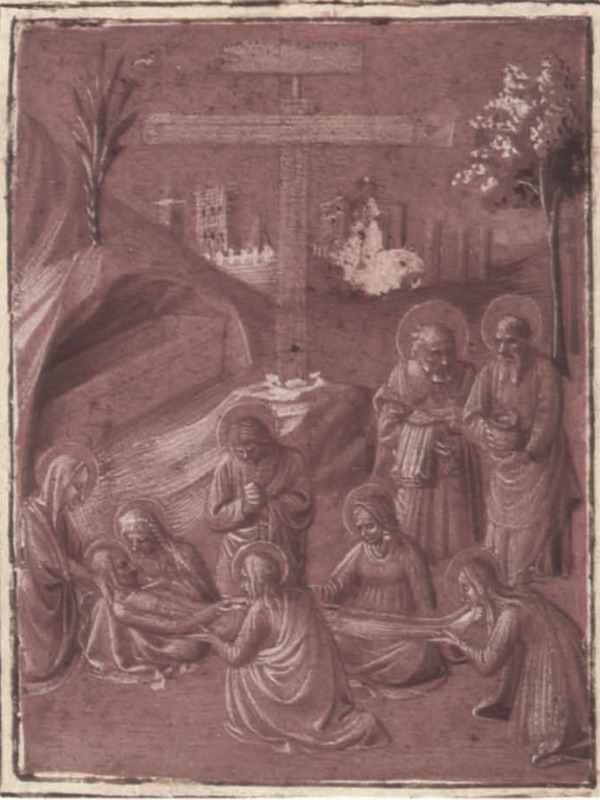 Tinted backgrounds distinguish several drawings by Angelico's collaborator Benozzo Gozzoli. 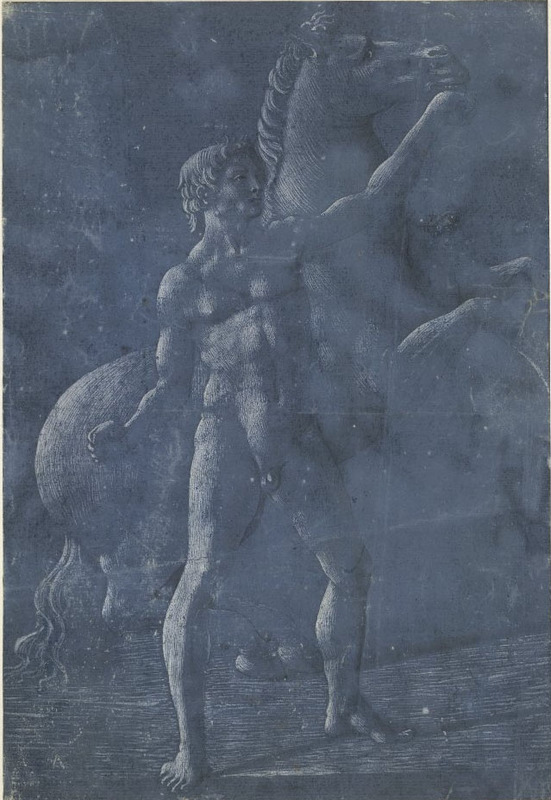 His drawing in the British Museum of one of the statues of the Dioscuri(*29) located on Rome's Quirinal hill has a deep blue ground, indicating that Gozzoli was experimenting with colored grounds during his sojourn in Rome with Angelico. 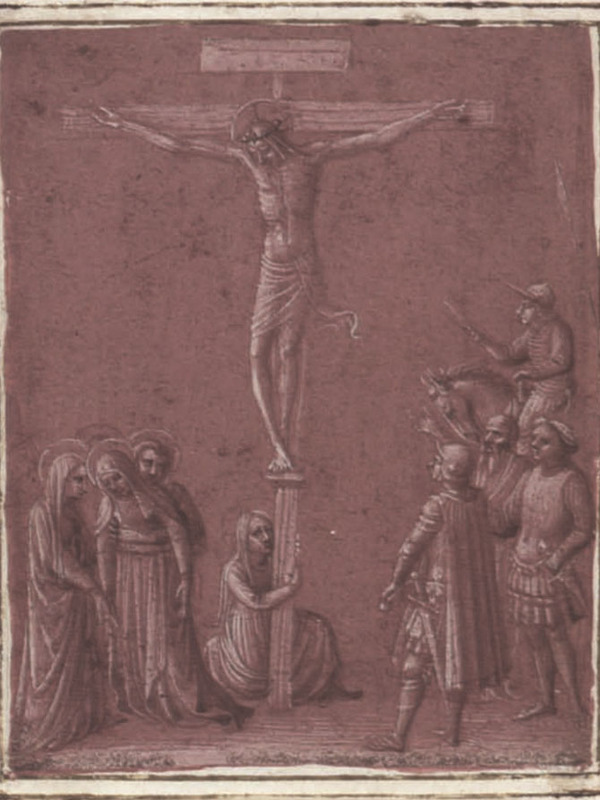 The similarly intensely colored drawings with violet backgrounds by Angelico's workshop must date to the master's Roman period. 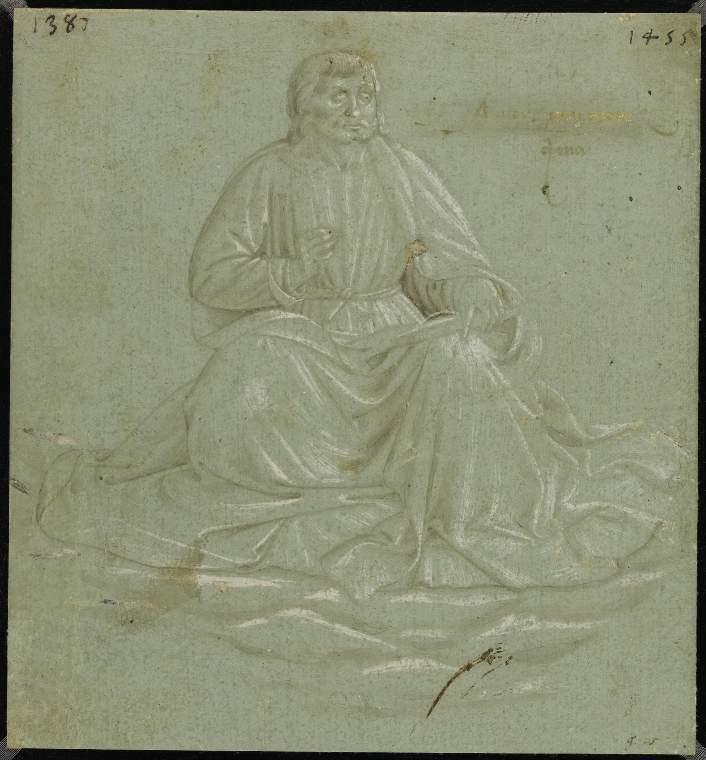 A hallmark of those drawings and Gozzoli's is the white gouache used to delineate outlines. Leon Battista Alberti's De pictura, written in the early 1430s in Florence, contains a long discussion on the use (and abuse) of white as a color. (*30) Alberti is critical of excessive use of white in painting, but notes that it should be employed to outline the illuminated side of a surface, with black applied opposite it, in the shaded areas: "With such balancing, as one might say, of black and white a surface rising in relief becomes still more evident. 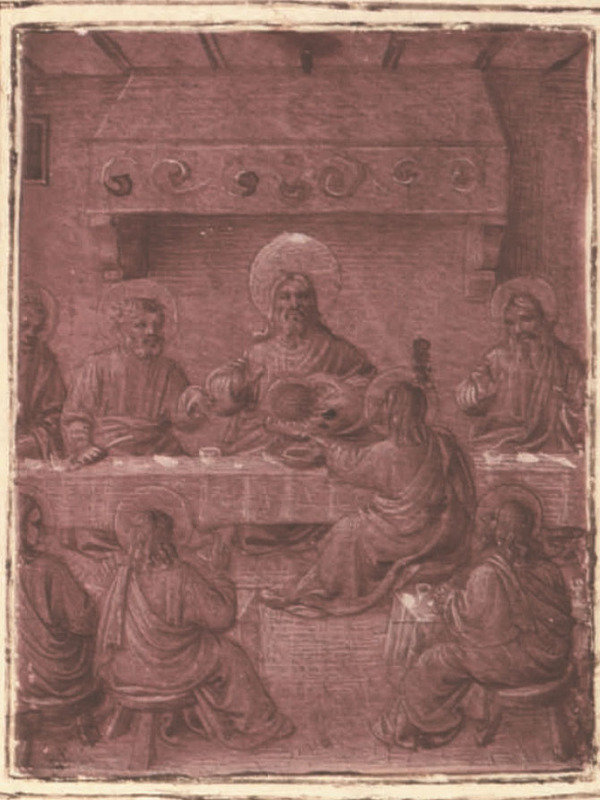 "(*31) Although speaking of painting, Alberti's ideas seem to find particular resonance in Gozzoli's remarkable drawings, in which the surfaces of objects, highlighted with white and a minimum of black, appear to "rise up in relief" against the colored background. The interregnum after Eugenius's death in early 1447 may have resulted in a suspension of work at the Vatican. That summer, Angelico's workshop moved to Orvieto, where the artist signed a three-year contract, perhaps not envisioning that the new pope would be employing him. 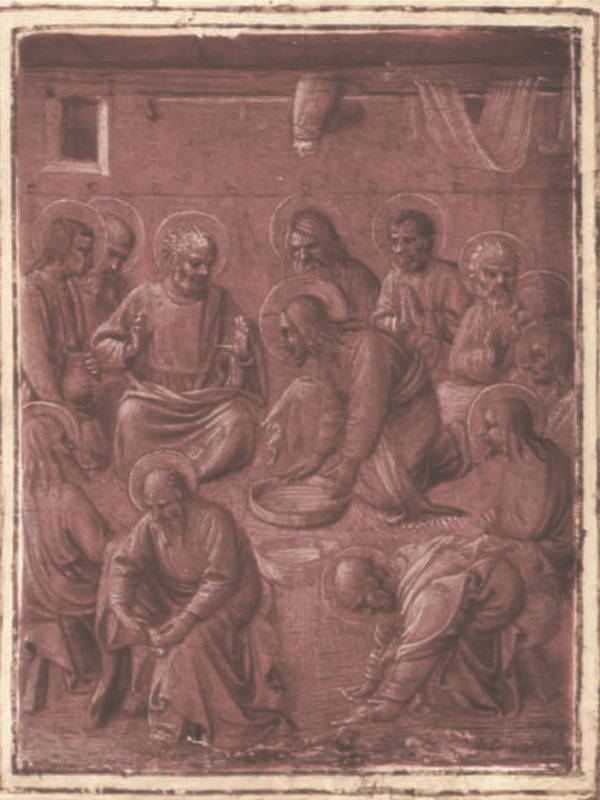 At this time he may have also begun the altarpiece for San Domenico in Perugia. The conclaves that elected Eugenius IV and Nicholas V pope took place in the Dominican convent of Santa Maria sopra Minerva, where Angelico lived when in Rome. 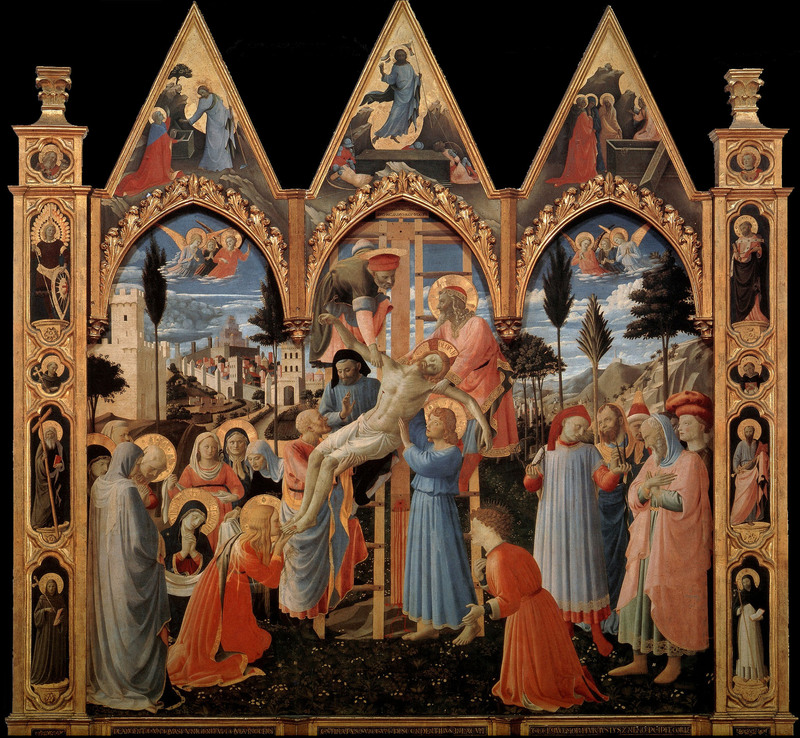 The most prominent member of that convent was the Spanish cardinal Juan de Torquemada, whom Angelico depicted kneeling at the foot of the cross in the Fogg Art Museum Christ on the Cross, between the Virgin and Saint John the Evangelist (cat. 39). 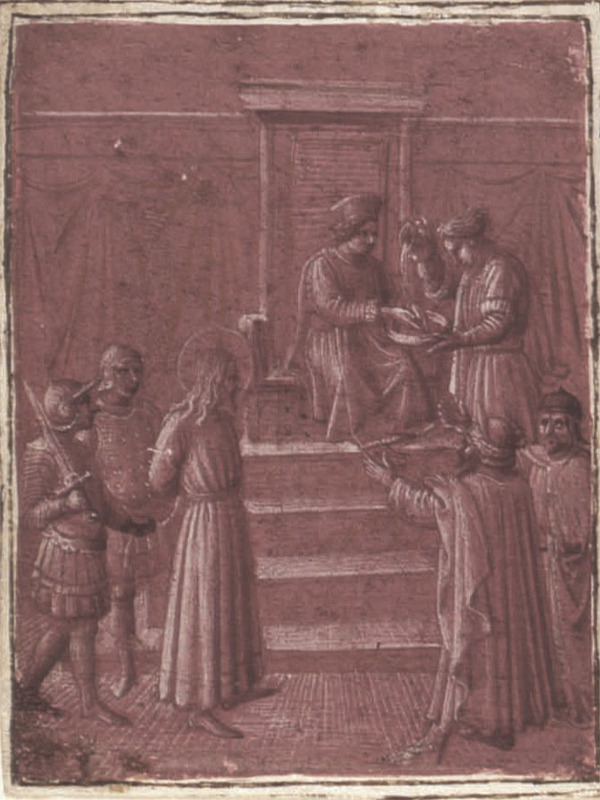 The elevation of Cardinal Tommaso Parentucelli to the papacy in 1447 as NicholasV brought Angelico a new patron, but one whom he would have known already from Parentucelli's stays in Florence in the entourage of Cardinal Niccolo Albergati. Angelico could certainly have met Parentucelli in 1441 at San Marco, where the great bibliophile had been given the task of organizing the library. Their first contacts might even date to their youth, when in the mid-1410s Parentucelli was a tutor in the houses of the powerful Florentines Rinaldo degli Albizzi and Palla Strozzi. (*48) It is likely that a relative of Rinaldo degli Albizzi, Jacopo di Alessio, who was governor of Angelico's native Vicchio in 1401-2, provided the artist with an introduction to Florence. (*49) For Palla Strozzi, Angelico later painted the Santa Trinita Deposition (fig. 53). Nicholas had depended heavily on Medici patronage. Always impecunious as a young prelate, even before becoming a cardinal, he borrowed money from the Medici bank, and, after becoming pope, he reestablished the Medici, temporarily out-of-favor in the last years of Eugenius's papacy, as the papal bankers,(*51) with Roberto Martelli, his former personal banker, heading the Roman branch. (Martelli controlled the accounts out of which Angelico was paid. )(*52) However, Nicholas remained loyal to the exiled Strozzi and to others in the same position. The pope was particularly solicitous of Felice Brancacci, Strozzi's son-in-law and Masolino's and Masaccio's former patron,(*53) and Strozzi's son Carlo became the pope's private chamberlain. For Nicholas V, Angelico frescoed the Chapel of Saints Stephen and Lawrence and a study in the Vatican palace,(*54) only the chapel, painted about 1448-49(*55) in close collaboration with Benozzo Gozzoli, survives. (*56) Their subject was particularly dear to Nicholas, who, in August 1447, had initiated an official inquest into the legitimacy of the relics in the Roman basilica of San Lorenzo fuori le Mum, where the two saints, each deacons of the Church, were said to repose in a common tomb. (*57) The relics of Stephen, whose life and martyrdom are recounted in the Acts of Apostles, had been transferred to Rome in the fifth century; Lawrence, a Roman deacon, was martyred during the anti-Christian persecutions of the third century. Nicholas's interest in the legends of Early Christian martyrs led him to commission the Florentine cleric Antonio Agli to write a new martyrology (De viris et gestic sanctorum) based on contemporary humanist scholarly grounds. Agli was highly critical of medieval hagiographers, who embellished tales to such an extent that "less pious men, puffed up by secular letters and learning ... ridicule not only the writings, but also the naivete of all Christians who could believe and accept such artless and childish stories. "(*58) Agli considerably edited the legends of Saints Stephen and Lawrence, which the thirteenth-century hagiographer Jacopo da Varagine had popularized in The Golden Legend (his text was the source for the medieval fresco cycle in the portico of San Lorenzo fuori le Mura). (*59) Yet, Agli's text, which was never finished, was not the basis for the Vatican cycle, for Agli had eliminated a central character in the legend of Saint Lawrence: Pope Sixtus II. (*60) Sixtus lived during the reign of Valerian (253-60), whereas Lawrence was reputedly martyred under that of Decius (249-51). This had already caused a problem for Jacopo da Varagine, who acknowledged the disparity in dates. 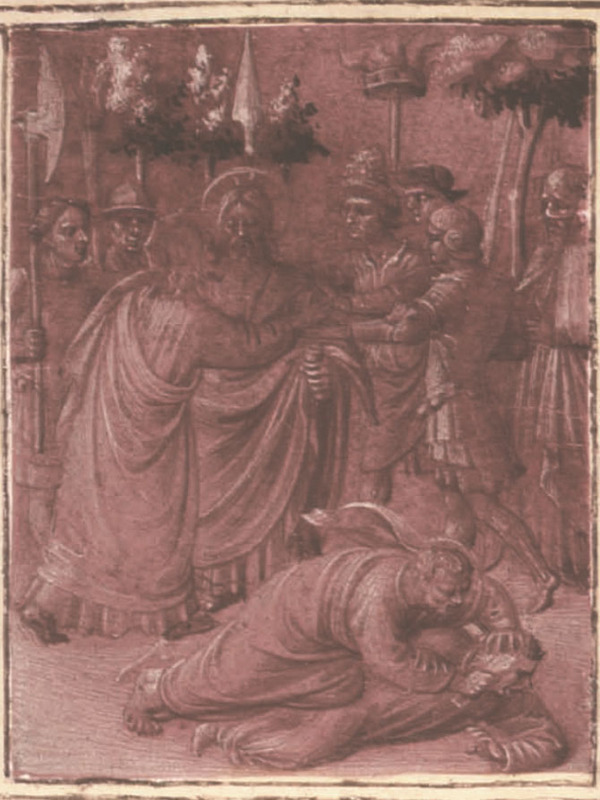 However, the Vatican cycle required the inclusion of a pope, and Sixtus was depicted with the features of Nicholas V.
Sixtus appears in two scenes: the Ordination of Lawrence as a Deacon (a counterpart to Saint Peter's Ordination of Stephen) and in the Consigning of the Goods of the Church to Saint Lawrence (fig. 121). In the second scene, Sixtus just manages to consign the treasures to Lawrence before soldiers break down the door and arrest the pope. The subsequent incident, the pope's martyrdom by beheading, is conspicuously absent, and, in fact, there was no tradition for its representation. Sixtus was a martyr, but his administration and care of the Church is the central feature of his legend. 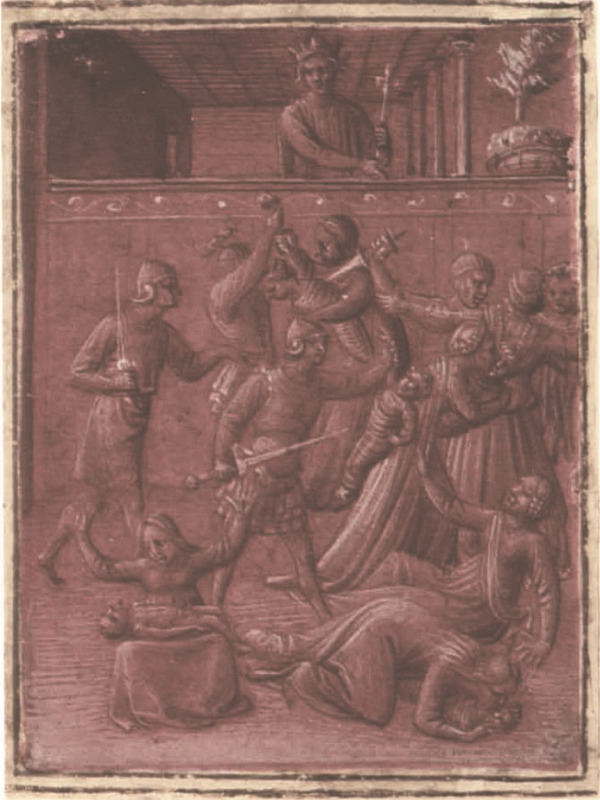 Humanists close to Nicholas V also praised him as a martyr, but as a martyr to his position. In a life of the pontiff written four years before his death, the De laudibus et divina electione, Michele Canensi,(*61) a scholar and Church canon, stated that Nicholas was a martyr not became of the blood that he shed but became of the cares and anxieties that he suffered tending to his flock; the French prelate Jean Jouffroy, who delivered an oration at Nicholas's funeral, called him a "living martyr". (*62) Angelico's frescoes underscore this. 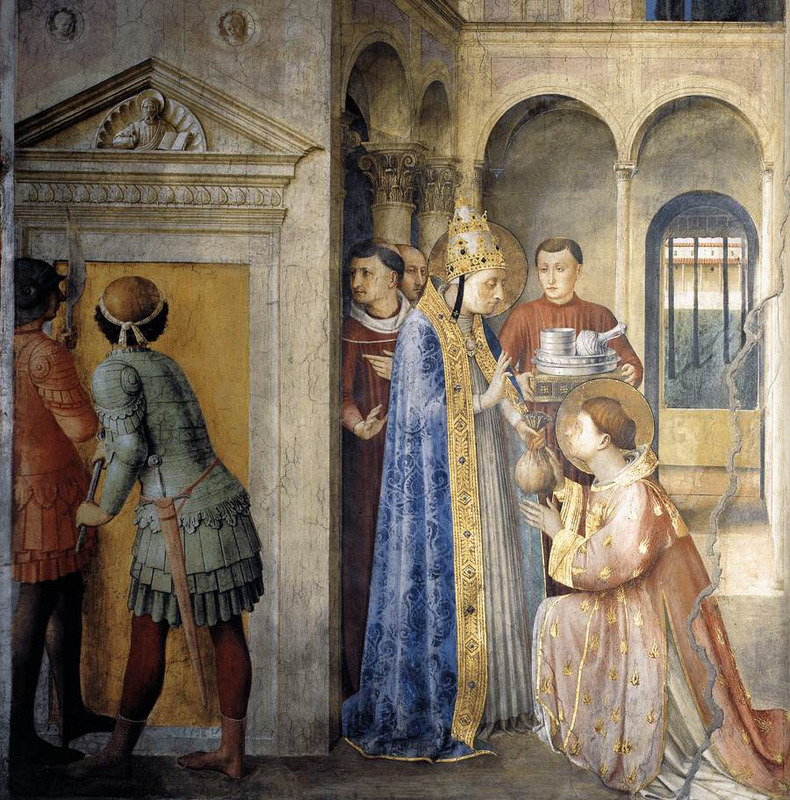 The scene of Sixtus giving Lawrence the Church treasure, depicted in the lower tier oldie entrance wall, is paired with Lawrence distributing the riches to the poor (fig. 124). Of the many paired narratives in the chapel, it is the only one in which the scenes are separated by a painted border; all the others have a continuous background. The border suggests a break between the two scenes and, specifically, the absent episode of the papal martyrdom. Nicholas's most ambitious project was for the basilica of Saint Peter. 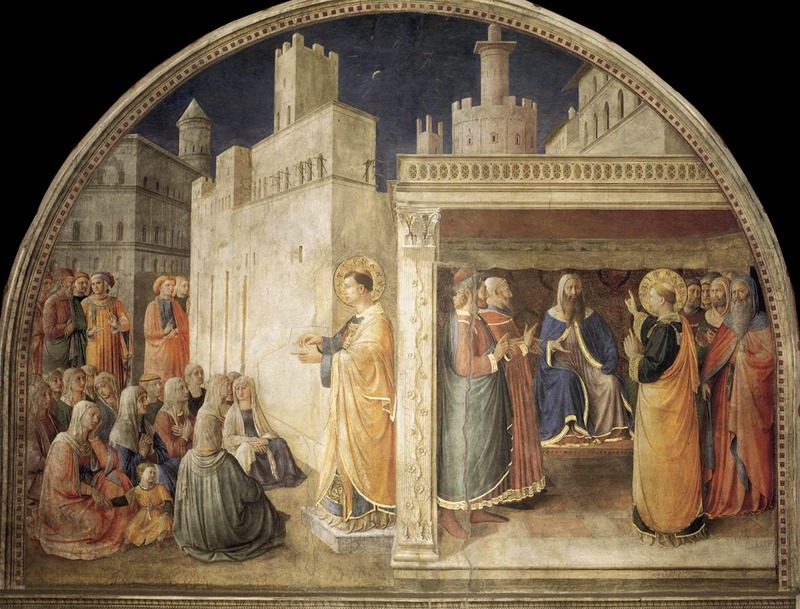 Angelico set three scenes (Saint Peter Ordaining Saint Stephen [fig. 126]; The Ordination of Saint Lawrence; and Saint Lawrence Distributing Alms) in Early Christian basilicas, which are obvious references to Saint Peter's and to Nicholas's plans for allowing more light into the dark church. Manetti describes the basilica as if the transepts and tribune had been opened up with oculi, or round windows, noting that they illuminated not only the cupola but showed all the faithful a visible example of the glory of God. (*67) Work on the church did not take place until 1450-51, after Angelico's frescoes were executed, but the system of oculi described by Manetti was never actually realized (only Gothic-style mullioned windows were constructed). (*68) However, the windows and, especially, the modern oculi depicted in the basilicas in Angelico's frescoes reflect the most current thinking about how the illumination of Saint Peter's might be improved. Oculi were an architectural element that interested builders and architectural theorists in this period, and in 1453 Bernardo Rossellino installed oculi in the Early Christian Roman basilica of Santo Stefano Rotondo (another reconstruction paid for by NicholasV in 1453). (*69) In Leon Battista Alberti's treatise on the art of building, the De re aedificatoria, presented to the pope about 1450-52, he noted that the ancients only used the quadrangular shape — perhaps a criticism of the round win-dows that were being proposed for Saint Peter's and were appearing elsewhere. (*70) They were a prominent feature of the dome of Florence Cathedral, and in 1443 Rossellino had served on a committee, also including Brunelleschi, Ghiberti, and Paolo dal Pont, Toscanelli, which debated whether the glass of these windows should be clear or colored and with or without figural representations. (*71) All but one member of the committee (a Franciscan friar, who later changed his mind) opted for colored glass with figures. Toscanelli argued that the oculi were more for ornament than for light ("piu tosto ad adorneza che per lame"), and even Brunelleschi clearly stated that they would appear richer with images. (*72) However, they were discussing a well-worn topic, for, from the start, Brunelleschi's project for the cupola had been criticized for not allowing enough light into the church. (*73) In 1426, its principal opponent, Giovanni di Gherardo da Prato, citing medieval optical treatises, had argued that natural light not broken by the refraction of a window would fall flat and not illuminate the cupola. (*74) The play of light across space and over surfaces was an important concern of architects, but one that they shared with painters, who had to calculate the source of light carefully in order to give form and dimensionality to the figures. Alberti asserted that windows in sacred buildings should be placed in the upper part of the wall so that only the sky was visible: "The awe that is naturally generated by darkness encourages a sense of veneration in the mind; and there is always some austerity about majesty. What is more, the flame, which should burn in a temple, and which is the most divine ornament of religious worship, looks faint in too much light. 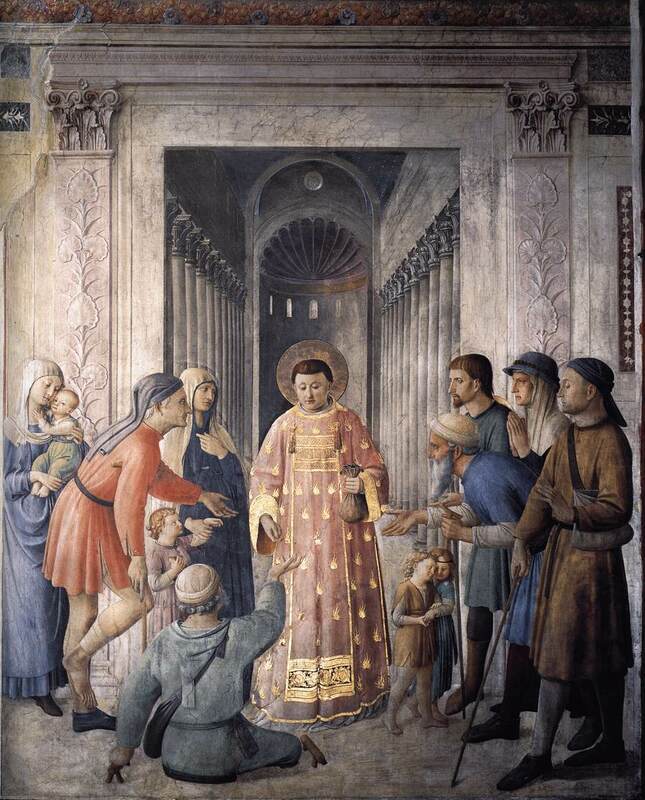 "(*75) Although there are no candles depicted in Angelico's Vatican frescoes, the contrast between the darkness of the interior and the light in the distant reaches of a sacred building is particularly well expressed in Saint Peter Ordaining Saint Stephen (fig. 126). Of course, light was not only a concern of architects, but an essential quality in painting, and ofAngelico's work in particular. In De pictura Alberti wrote at length about how to depict the fall of light across an object as well as in a historia, or a painted scene. He defined the problem as the "reception of light" (luminum receptione), which he described as one of the three principal elements of the art of painting (circumscription and composition being the others). (*76) Angelico had been particularly attentive to the painting of light in the frescoes in San Marco. The fresco known as the Madonna of the Shadows (fig. 127) in the long corridor of the dormitory, as its title implies, shows the shadows cast by a raking light from the window at the end of the hall. A specific light source and a fleeting moment in the time of day is rendered in a way that Alberti might have found too literal and that Angelico avoids in the Vatican frescoes, but that seems to echo earlier artistic concerns; Cennino Cennini in his Craftsman's Handbook, writ-ten about 1400, had instructed artists to be aware of the source of light (particularly in the windows of chapels) and to apply relief and shadow accordingly. (*77) Rarely, however, was light depicted as so fugitive as in Angelico's San Marco frescoes. In those on the cell walls, each painted near or next to a window, Angelico played on the temporal quality of natural light — often contrasting it with light from a divine source (as in the Annunciation in cell 3) — by making it appear to shimmer across surfaces. He might have been taking up the idea, here, also elucidated by Alberti, that when an artist wishes to study the play of light on a three-dimensional object, it helps if he dims his vision by half closing his eyes to make the light appear less strong. (*78) In general, the effects of light depicted in the Vatican frescoes are much less temporal than at San Marco. Light has a unifying effect, but only, as Alberti recommended, in the way in which it picks out surface details and sets them in relief. Such is the case in the Vatican frescoes, giving the figures a statuesque appearance and the scenes an intentionally timeless quality. The Vatican chapel bears Angelico's name, and, through the ages, its decoration has been his most famous work,(*79) but the frescoes nevertheless are a product of his workshop. The settings, the distribution of the figures, and the unified lighting bespeak Angelico, but much of the execution appears to have been entrusted to Benozzo Gozzoli. There exist three Gozzoli drawings related to the chapel, one for figures in the scene of Saint Lawrence Distributing the Goods of the Church and Saint Lawrence before Decius (Windsor Castle, Royal Library), and studies for the Saint Matthew (Fitzwilliam Museum, Cambridge) and the Saint Mark (Musee Conde, Chantilly) on the vault of the ceiling. The attitudes of the Dominican order toward work and the regulation of its convents and its activities might have influenced how Angelico organized his workshop. The Dominicans are the Order of Preachers. Although the artist was not trained to be a professional preacher, which required a three-year study of theology, he did attain the position of prior vicar and then served as a prior of his convent in Fiesole. (*81) This meant that he reached a level of responsibility that was on par with that of a qualified preacher, because pri-ors controlled who could preach. (*82) In fact, his activity as an artist should be viewed in the context of the preaching profession. The Dominican Constitutions, or Rules, required that each preacher be given a socius when he was sent out in the world: "The socius given to a preacher was to obey him like his own prior. "(*83) Gozzoli was documented in the payments for the Orvieto frescoes as Angelico's "consotio," and he clearly acted as such in the execution of theVatican frescoes. (*84) In the 1442 tax declaration of Gozzoli's grandfather, when the painter was already a mature twenty-four, it is stated that Benozzo "was learning to paint." The Florentine tax authorities did not accept this explanation, but given Gozzoli's role within the Angelico workshop, it was a truthful statement. (*85) Gozzoli's subordinate yet easily recognizable full participation in Angelico's major projects at San Marco, the Vatican, and Orvieto suggest a new interpretation of workshop organization, and one that might well be informed by the close preacher/socius relationships that the Dominican order encouraged. Certainly, Angelico's reliance on Gozzoli or on such other collaborators as Zanobi Strozzi would have been in no way frowned upon in the order. The relationship between Angelico and Gozzoli appears to have been different from the usual early-fifteenth-century Florentine artistic partnerships, which for the most part were business oriented and lasted for circumscribed periods of generally three years. (*86) A stylistic unity even on a common project was not necessarily required, the most famous example being Masolino's and Masaccio's widely different frescoes in the Brancacci Chapel. The pattern established in Trecento Florence of large family workshops like those of the Cioni (Orcagna) and Gaddi, which engaged many assistants and outside partners for important undertakings, had died out by the mid-fifteenth century. Unable to assemble a workshop along those lines, Angelico created a new type of organization following a model adapted from his religious order. With the able Gozzoli working as his consotio, Angelico could concentrate on his roles as overseer, theoretician, and theologian, functioning essentially as a preacher and employing not words but pictures. After his death, the artist was revered as a theologian, and was given the name Angelico in direct homage to the greatest theologian of his order, Saint Thomas Aquinas, who was known as the Angelic, or Seraphic, Doctor. (*88) During the last decade of his activity Angelico created three cycles of paintings of episodes in the life of Christ (the frescoes in the now destroyed Chapel of the Sacrament for Eugenius IV; the doors of the silver chest at Santissima Annunziata for Piero de' Medici; and the now destroyed frescoes in the cloister at Santa Maria sopra Minerva, Rome, for Cardinal Juan de Torquemada) and one cycle devoted to Early Christian history (the legends of Saints Stephen and Lawrence in the Vatican). In each, Angelico's exploration of new ways of depicting sacred events was equivalent to the sermons of a Dominican preacher. 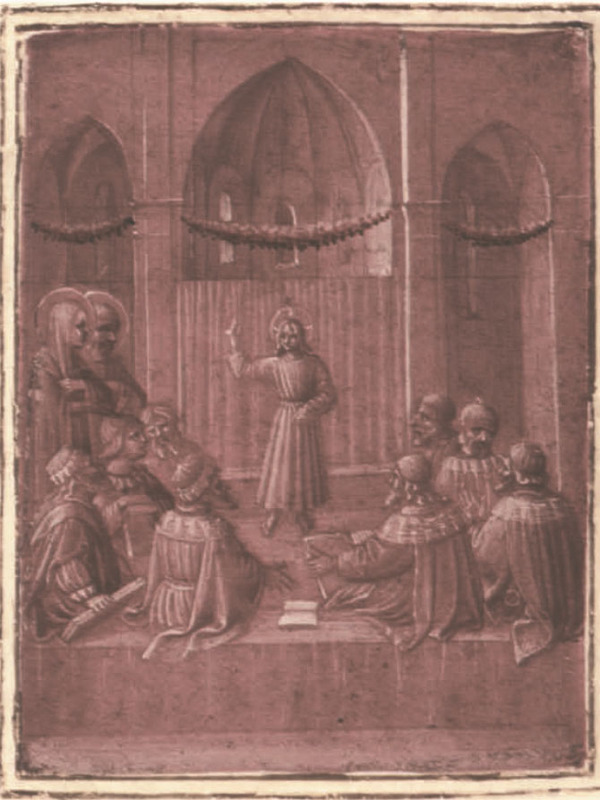 In 1452, Aeneas Sylvius Piccolomini (later Pope Pius II) wrote a letter to the Swiss humanist scholar and amateur painter Nildas von Wyle in which he associated painting with oratory, noting that the aims of the two disciplines in effect mirrored each other. Piccolomini also recounted the history of pagan and Christian oratory up to the time of Petrarch, and examined the revival of painting under Giotto, comparing the similar trajectories of the two arts. (*89) This would not have been lost on Angelico, who was intimately familiar with the practice of preaching and its humanist conterpart, oratory, as well as with the by-then commonly held theories about the revival of painting by the Florentine master Giotto. Working for a pope intent on the renovatio of Rome, Angelico found an outlet for his voice as a modern painter on the walls of the Vatican, and participated fully in the humanist project to further the art of painting. (*1). G. Manetti 1999 ed., pp. 178-91. (*2). The medal is recorded in Buonanni 1699, pp. 51-53, ill. on pl. after p. 48. N. T. Whitman (1991, p. 820) claims that only Andrea Guazzalotti's 1455 medal of Nicholas V was made during the pope's lifetime or shortly after his death; the subject has not otherwise been very well investigated. See B. Paolozzi Strozzi, in Paolozzi Strozzi 2000, pp. 81-82. 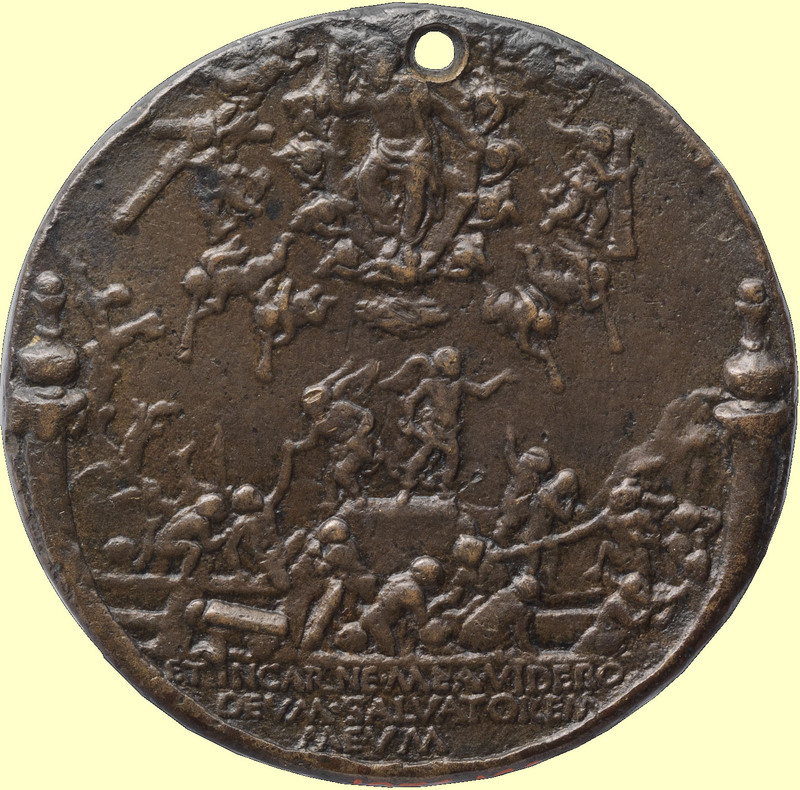 Some of the medals were made about 1664 by Girolamo Paladino. See Modesti 1988, PP. 7-57, esp. pp. 29-32; Attwood 1989, pp. 24-27. (*3). The inscription is found on ancient Roman coins (Urbs Roma Felix), but the term has long had Christian associations. Paulinus of Aquileia's eighth-century hymn to the apostle Peter contains the much-repeated verse: "0 Roma felix, quae tantorum principum / Es purpurata pretioso sanguine" ("0 Happy Rome, which is made purple by the prized blood of so many princes"). (*4). Gilbert 1975, p. 260. (*5). Strehlke 1998, p. 54. (*6). This was common practice. For an example in Monza, see C. B. Strehlke, in B. Agosti et al. 1998, pp. 24-27. (*7). G. Agosti and Hirst 1996, p. 683 n. 7. (*8). M. Boskovits, in Toscano and Capitelli 2002, pp. 174-75. (*9). Ficarra 1968, p. 130. (*10). Meiss 1951, pp. 76-77. (*11). Draper 1992, pp. 82-86. (*12). Many details differ from the original. 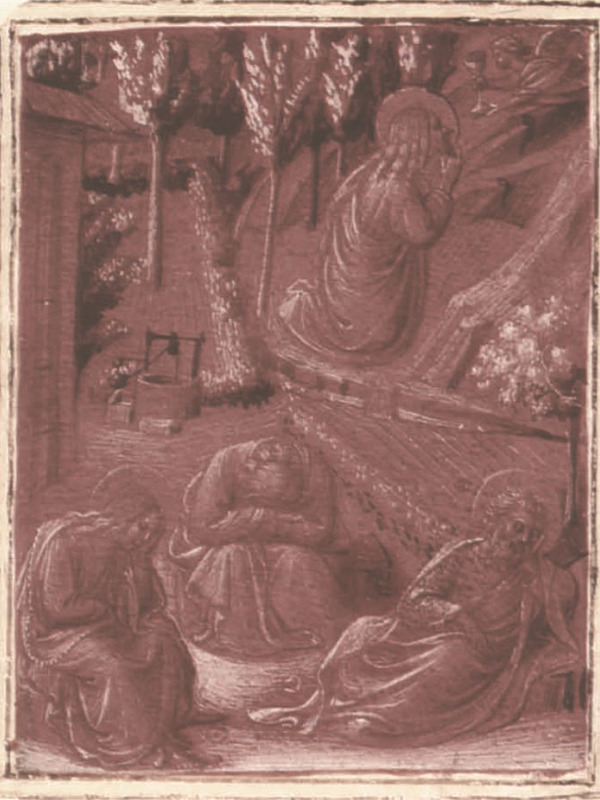 Some, such as the presence of several Franciscan friars being received by angels at the gates of Paradise, might be an indication of the patronage or original purpose of the print. 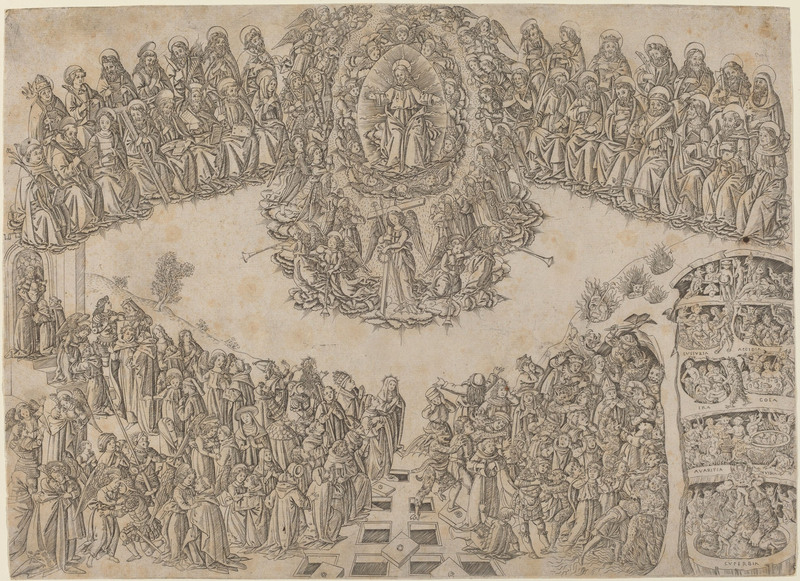 Rosselli also made engravings after works by Uccello and by Botticelli.The plate of the Last Judgment is listed in the inventory of the workshop of Rosselli's son Alessandro (d. 1525). J. A. Levenson, in Levenson, Oberhuber, and Sheehan 1973, pp. 60-62. (*13). De Simone 2002, p. 55, fig. 46. (*14). Galleria Nazionale di Palazzo Venezia, and Gem'aldegalerie, Staatliche Museen Preussicher Kulturbesitz. (*15). Pope-Hennessy 1974, p. 221. (*16). The painting was bought from a Roman baker in 1811 and then owned by Cardinal Fesch. It was sold at the auction of the Fesch collection in 1845 to Prince Musignano (probably Charles-Lucien Bonaparte, Prince of Canino and Musignanon [1803-1857]). It then is recorded in England and later in Berlin in 1884. A copy of it, in the Museo Civico, Catania, most likely dates to the nineteenth century and has not been properly studied or published. It shows slight changes in the composition, which might indicate the copyist knew the Berlin painting before it was cut down (see the Alinari photograph, neg. no. 55340; edizione 1952). Pope-Hennessy (1974) records another variant of the composition attributed to the Master of Marradi. 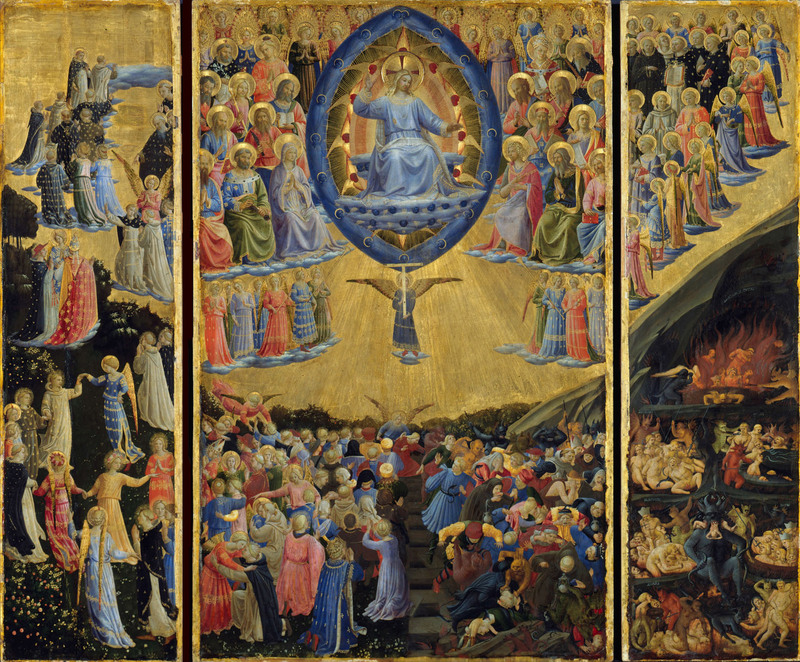 This is actually the Last Judgment by Zanobi Strozzi (cat. 45), which is derived from the Berlin and Florence paintings of the same subject and was partially repainted in the fifteenth century with figures added. (*17). The painting was inventoried in 1750 in the Roman collection of Cardinal Neri Maria Corsini (1685-1770), nephew of Pope Clement XII (r. 1730-40), as having been presented to the cardinal by Baron Mantica, a Roman nobleman. See Magnanimi 1980, p. 118, inv. nos. 220-222, p. 124. A note added by Corsini's curator, Gaetano Bottari, contains the information "e dal Cardl Bardi" ("and by Cardinal Bardi") — a reference to Cardinal Girolamo Bardi, a Florentine, whose career had been linked to that of the Corsini pope; he was nominated a cardinal in 1743. See Moroni 1840-61, vol. III (1840), pp. 123-24. The original owner and place of production are not known. (*18). Boskovits 1976 b, pp. 43,45. (*19). Pope-Hennessy 1974, pp. 235-36, fig. 115. (*20). Pia Palladino (see p. 251) quotes Cennino Cennini about drawing on tinted paper: he specifically mentions the colors pink and violet. (*21). Several passages from the writings of Saint Jerome, which Renaissance ecclesiastics and humanists would have known, describe purple codices as great vanities. In the preface to the Book of Job in the Vulgate, he wrote: "Let those who will keep the old books with their gold and silver letters on purple skins, or, to follow the ordinary phrase, in 'uncial characters,' loads of writing rather than manuscripts, if only they will leave for me and mine, our poor pages and copies which are less remarkable for beauty than for accuracy." Jerome 1893 ed., p. 492. Saint Jerome also mentions such luxurious codices in epistles XXII (32) and CVII (12). (*22). G. Mariani Canova, in Alexander 1994, pp. 23-25. See the manuscript of Petrarch's Canzoniere and I Trionfi (Victoria and Albert Museum, London, L. 101-1947), illuminated in Padua about 1463-64: J. J. G. Alexander, in Alexander 1994, pp. 152-54, no. 71; Alexander 1970, pp. 27-40. See, recently, on the revival of Renaissance purple manuscripts, Mariani Canova 1998, pp. 339-71. (*23). "A Verona vidi in Libro antico nella sacristia, el Vangelistario in carte del vestimento di Jhesu, tune le lettere d'ariento e ove si nominava Jhesu erano lettere d'oro"; quoted in Lowe 1934-66, vol. IV (1947), no. 481, p. 22; cited in Alexander 1970, pp. 27-40. (*24). Lowe 1934-66, vol. III (1938), no. 281, p. 3. (*25). There is little information on the provenance of the drawings. When they were sold at auction in Amsterdam in 1927 they were in an eighteenth-century volume bearing "the royal arms" — presumably those of the Dutch royal house of Nassau-Orange. (*26). The miniature is in the Galleria degli Uffizi. Recently, Andrea De Marchi attributed it, with some question, to the Perugian Benedetto Bonfigli. Seemingly dating before Frederick's coronation as emperor, the portrait, De Marchi suggests, might have been a present for Frederick's betrothed, Eleanor of Portugal, whom he married by proxy in 1451 and whom he finally met in Siena in February 1452. See A. De Marchi, in Christiansen 2005, pp. 210-12. (*27). It is said that in Padua, which Frederick III visited in January 1452, he invited the painter and antiquarian Francesco Squarcione to call on him: see Scardeone 1560, p. 370. M. Meiss (1961, p. 61) is dismissive of this notice. (*28). C. B. Strehlke, in B. Agosti et al. 1998, pp. 29-30. (*29). Cole Ahl 1996, colorpl. 1. (*30). Alberti 1972 ed., pp. 89, 91. (*32). Pope-Hennessy 1974, p. 214. In my 1998 monograph on Fra Angelico (p. 51), I mistakenly confused this nephew with the worker Antonio di Giovanello, who fell from the scaffolding in Orvieto Cathedral and died; see Orlandi 1964, p.
(*33). Gozzoli had a contract with Ghiberti, which lasted until January 1447. He is first documented in Rome in May of that year, but could have arrived earlier. (*34). Actually, Strozzi's whereabouts in 1446-47, when he rented his house in Fiesole to a group of widows, is unknown. Lillie 1986, pp. 142-43, 150 n. 62. (*35). They were Pietro Giacomo from Forli in Romagna, Carlo di ser Lazzaro from Narni in Umbria, and Jacopo d'Antonio from Poli, a town just outside Rome. (*36). Garibaldi 1998; reviewed by the present author (1999, pp. 477-79). See also catalogue number 30. (*37). De Marchi 1985, pp. 53-57. (*38). The brothers Bernardo and Marco di Bartolomeo Bartolini. See Orlandi 1964, pp. 20 n. 2,47. (*39). T Biganti, in Garibaldi 1998, p. 111 n. 56. (*40). An X-radiographic analysis of the three existing sections of the predella has not been undertaken to determine if they were originally painted on a single plank, as would likely have been the case.The predella would also have had elements at the ends, probably with coats of arms, as well as between the scenes (possibly with representations of angels, as on the predella with scenes from the life of Saint Dominic, in Cortona); these are now missing. (*41). The date and original location of this work has been much discussed: see Pope-Hennessy 1974, pp. 211-12; Hood 1993, pp. 102-7; Strehlke 1998, pp. 44-45. See also pages 146,229-30. (*42). The other surviving panel from this complex is Pesellino's The Journey of the Magi: Melchior Crossing the Red Sea in Williamstown, Massachusetts. Alfonso's heraldic colors are displayed on several boats, indicating the possible destination of the paintings — or, at the very least, referring to the king and to the conquest of Naples. For a discussion of the attributions, see E. Fahy, in Di Lorenzo 2001, pp. 71-75; and catalogue number 54 A. (*43). Boskovits 1976 b, pp. 43-45, fig. 16. (*44). Eubel 1901, p. 74. San Sisto remained without a titular cardinal until 1471 (ibid., p. 65). (*45). Barstow 1990; Hood 1993, pp. 227-28; De Simone 2002, pp. 41-87. (*46). De Simone 2002, p. 46, fig. 2. (*47). Strehlke 2003a, p. 541, fig. 62. (*48). G. Manetti's biography of the pope (1999 ed., pp. 88-89) mentions the period he spent as a tutor without identifying the patrons because of their subsequent disgrace. The later biographerVespasiano da Bisticci (1963 ed., p. 32) is less circumspect and identifies the men. (*49). Strehlke 2003 b, p. 16. Angelico's and Albizzi's families remained in contact until at least 1441, when Angelico's sister received an inheritance from Jacopo's widow. (*50). Padoa Rizzo 1981, pp. 15-17; Strehlke 1998, p. 53. (*51). In his later years, angry with the Medici, Eugenius had engaged another Florentine banker,Tommaso Spinelli; De Roover 1963, p. 198. (*52). Orlandi 1964, p. 189. (*53). Pandimiglio 1987, pp. 100-101. (*54). He also did some unspecified work on the tribune at Saint Peter's, which seems to have been located under the apse where there was an Early Christian mosaic that had been restored in Late Medieval times. (*55). The chapel may have been finished earlier as Angelico seems to have been in Florence in October 1448 (see cat. 60). However, trips to and from Rome and Florence may have been more frequent than we have documents for, and, as discussed below, Gozzoli actually executed most of the frescoes. 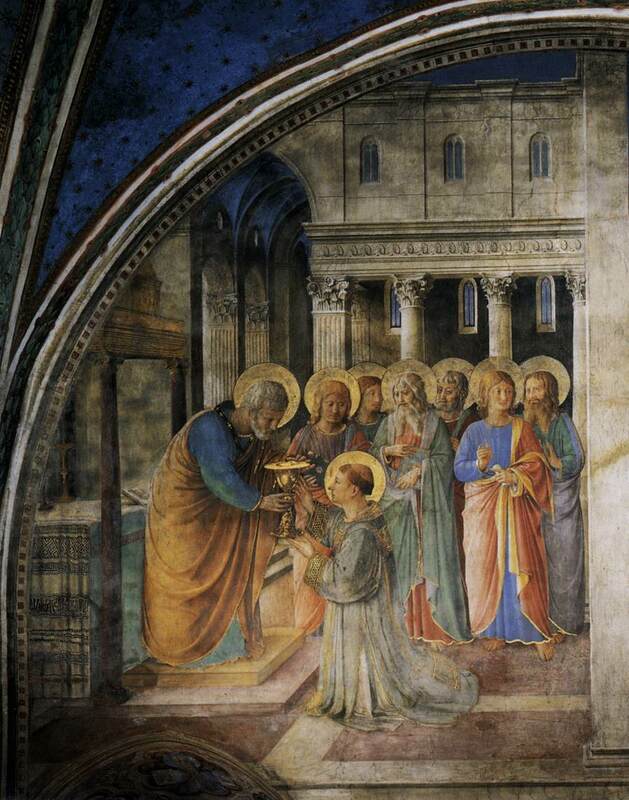 It is interesting that, in 1450, when he commissioned an altarpiece for the Certosa in Bologna, Nicholas did not turn to the Angelico team but rather to the Venetian Vivarini.This may well be because the Florentines were not available. 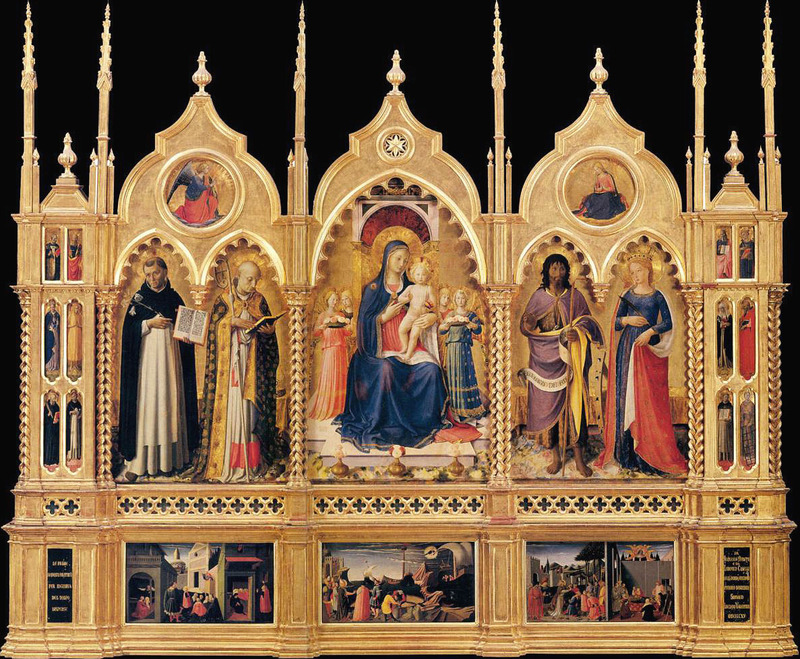 On Nicholas's commissioning of that altarpiece, see Aurigema 2000, pp. 415-24. (*56). For an analysis of Gozzoli's role in the cycle, see Cole Ahl 1996, pp. 24-33. Two books on the chapel were published after its restoration and illustrate it fully: see Venchi et al. 1999; Buranelli 2001. A. Nesselrath's essay, inVenchi et al. 1999 (esp. pp. 80-92), places great importance on Gozzoli's participation. (*57). Borsook 1980, pp. 81,103. (*58). Salatino 1992, p. 197.This unpublished dissertation is a superb study of the humanist world of NicholasV and its importance for the Vatican frescoes. On Agli, see D'Addario 1960, pp. 400-401. (*59). S. Romano 1992, pp. 25-26. (*60). Salatino 1992, p. 202. (*61). Miglio 1975, pp. 10-12. (*62). Salatino 1992, p. 115. See also Stinger 1985, pp. 170-74. (*63). Burroughs 1990, pp. 58-59. (*64). Salatino 1992, pp. 219-20. (*65). Pastor 1938-61, vol. II (1949), p. 314. (*66). Cantatore 2000, pp. 399-410; Frommel 2004, pp. 144-68. (*67). G. Manetti 1999 ed., pp. 147-48. (*68). Mack 1982, p. 63; Frommel 1997, p. 107. (*69). Mack 1987, pp. 35-36,50-51. (*70). Alberti 1988 ed., p. 223 (7:12). (*71). The document is published in Guasti 1857, pp. 76-77, document 201. See also Haines 1983, pp. 126-27. (*72). Guasti 1857, p. 77. (*73). Saalman 1959, pp. 11-20. (*74). Giovanni di Gherardo wrote: "If the sun should enter the window without being interrupted by glass and was broken on the opposite pier, it would light [the octagon] by reflection. Now, does anyone think that this reflection is of such force that it would reflect upwards a distance of more than seventy braccia. I am certain that it would not. All reasoning makes clear to me and you could find it [written] in the treatises De speculis and Prospettivis. Now imagine how much light the windows will give when the light is interrupted by glass.You have an example of that in Santa Liperata [Florence Cathedral] in the front windows over the doors" (Saalman 1959, p. 13). (*75). Alberti 1988 ed., p. 223 (7:12). For an analysis of Alberti's ideas on sacred architecture, see Lawson 2001, pp. 45-68. (*76). Alberti 1972 ed., pp. 66-67,86-93. (*77). Cennini 1960 ed., p. 6 (chap. 9). (*78). Alberti 1972 ed., pp. 100-101. (*79). Strehlke 1998, pp. 91-93. (*80). Cole Ahl 1996, pp. 32-33. (*81). Angelico was prior vicar in 1432,1433, and 1436, and prior from April 1450 to June 1452; see Orlandi 1964, pp. 40-41, 114-15. (*82). Hood 1993, p. 299. (*84). Cole Ahl 1996, p. 38. (*85). D. Cole Ahl (ibid., p. 283 n. 16) interprets the statement as a tax dodge, but it seems, in fact, to reflect Gozzoli's actual situation in Angelico's shop. (*86). On partnerships in Florence, see Procacci 1960 a, pp. 3-70. For the part-nership of Masolino and Masaccio, see R. Bellucci and C. Frosinini, in Strehlke and Frosinini 2002, p. 86. (*87). Strozzi was never a guild member and Gozzoli was enrolled only in the Florentine Compagnia dei Pittori, not the painters' guild. (*88). Strehlke 1998, p. 8. (*89). "Gaudeo igitur, quod to pictorem et oratorem simul video." Piccolomini 1918 ed., pp. 100-101; Spencer 1957, p. 27; Salatino 1992, p. 207. Piero della Francesca gives a similar account of the art of literature during the reign of Emperor Augustus and of the pictorial arts — in particular, his own painting — under the patronage of Federigo da Montefeltro, in the preface to the Libellus de quinque corporibus regularibus (Piero della Francesca 1995 ed., vol. I, fol. 1r). Comparisons with ancient glories were equally valid for Angelico. In the epitaph on the tomb of Fra Angelico in Santa Maria sopra Minerva, Rome, the name of Apelles is evoked. See Strehlke 1998, pp. 8,67 n. I.